State Bank of India have launched all new Windows App with all new features that were missing in previous version of State Bank Anywhere (SBI) Windows App. Below are the list of features of State Bank Anywhere (SBI) Windows App. But before you start using the State Bank Freedom Windows App you will have to complete the registration process for State Bank Anywhere Windows application. Below are the step by step guide for State Bank Anywhere (SBI) Windows App Registration. Just login to Online SBI Internet Banking. And navigate to My Accounts > Windows App Registration. Kindly proceed with One-time registration process for State Bank Anywhere – Windows application. This One-time registration process is required to login to State Bank Anywhere Windows application, available on Windows Store. Enter the One Time Password received on your mobile phone. On successful verification, on the next page, kindly enter your login password. You would be displayed a Registration confirmation message after successful validation of your credential. 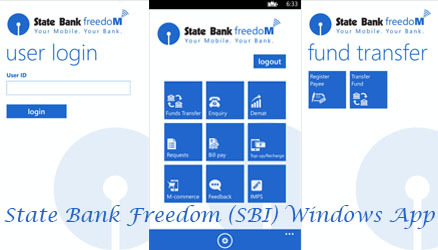 Alternatively you can even register for SBI Freedom Windows App by visiting the branch or through ATM.